Trapped by the inexorable logic of the Cold War into taking the world to the brink of nuclear annihilation during the Cuban missile crisis, John F Kennedy was transformed from Cold Warrior to Soldier For Peace. His journey started when Kruschev reached out to him in the aftermath of the crisis, seeking to find common ground through a personal relationship. The two men came to understand that both were pawns in a deadly game whose rules were such that neither was able to dictate the moves. Kruschev was under constant pressure from the hardliners in the military and the Politburo, while JFK was following a foreign policy that was dictated by his predecessors and the corporate interests they ultimately served. Kennedy came to realize that only by changing the rules of the game would peace ever become possible. In JFK and the Unspeakable: Why He Died and Why it Matters, James Douglass describes in detail the course of his transformation. Kennedy publically attacked the CIA after being lured into the Bay of Pigsfiasco, firing its Director and decreasing funding. He took on the banks by issuing an Executive Order authorizing the government to create money at no interest. He angered the barons of the steel industry by cutting them out oflucrative contracts when they reneged on a deal on price limits. Defense contractors and the hawks in government and the military were aghast at his unilateral atmospheric test ban treaty and his order to withdraw from Vietnam. All of these actions put him in direct conflict with the military-industrial complex. 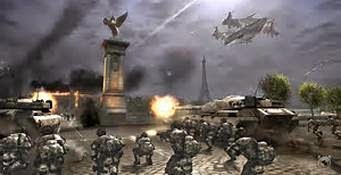 The empire builders and war profiteers saw danger in the growing sense of hope in America that world peace was possible. Though the speech received relatively little attention in the US media, it was broadcast endlessly in Russia. As Kennedy noted in the speech, having lost over 30 million soldiers and civilians in WWII, Russians had a keen appreciation of the true costs of all-out war. Although no living American had experienced war on their own soil, both sides had lived under a nuclear cloud so long that they shared a common relief in the prospect of calling a halt to the insanity of the arms race. This was in all likelihood why Kennedy was silenced in what the House Select Committee on Assassinations would later determine was “most probably” a conspiracy, one that has never been fully investigated. To this day, thousands of documents in the Kennedy files remain classified. Meanwhile, the CIA continued its efforts to rewrite the history of JFK's attempts to end the Cold War that began shortly after his assassination. Following the House committee's report, the New York Times forced the CIA to reveal a document outlining its strategy to marginalize anyone who challenged the official theory of his murder by labeling them "conspiracy nuts," an effective tactic that is used today with anyone who challenges the government's official conspiracy theory of 9/11. The Cold War raged on for years, ending only when the Soviet Union collapsed from the burden of supporting a military necessary to defend itself from aggression by its former allies and other costs imposed by the expanding Anglo-American empire and its compliant partners, including former enemies Germany and Japan. Once the communist government was surrendered by Yeltsin, American crony capitalists moved in to split its assets with Russian oligarchs, expanding the Mafia-like organization of “democratic” states. Unbeknownst to most of the world at the time, Russia remained the implacable enemy of the Empire, which sought to surround it with NATO bases and missiles until the time was right to attack. That time appears to be coming, as the Anglo-American empire moves to Russia’s doorstep, having bought the loyalty of the leaders of the great majority of former Soviet republics. America has become the sole military superpower, with the greatest concentration of wealth, weaponry and political influence in human history. It is carefully preparing the American public to accept an attack on Russia by staging provocations in Syria, Iraq, Ian and Lebanon while demonizing Putin for acting as any responsible leader would. When he refuses to take the bait, as in Ukraine and Syria, the CIA and its partner in the State Department manufactures stories of its aggression and imperial ambitions. Meanwhile, they use Saudi Arabia and its network of terrorists to undermine any nation that dares stand up to the Empire. As anyone who has been paying attention knows, the neocons and Israel are carrying out a longstanding plan to destabilize these nations. Iraq, Libya, Somalia and Sudan have fallen and Lebanon has been dangerously destabilized. The sights of the Empire are now fixed on Iran, the greatest remaining Soviet ally that is not already destabilized or under military siege. It is far past time to finish the work that Kennedy began at the cost of his life. Americans, who are increasingly falling victim to the depredations of the banksters that control its government, must recognize that their interests are inextricably tied to those of the Russian people. The same is true for those around the world aspiring to economic justice and democracy. Every human at risk of being enslaved in a permanent fascist New World Order shares the same needs and aspirations. They can and must build a united international front against fascism and war if any of our children are to live free. We are one People. We are all Russians now. Jewish American reporter Max Blumenthal’s latest book is a must-read for anyone struggling to understand why Jewish Israelis support ultimately self-destructive policies of their government. While expressing understanding of the sociological roots of its endemic racism, Goliath: Life and Loathing in Greater Israel is a searing indictment of Israeli policies and society. Through exhaustive research and countless interviews over a four year period spent mostly in Israel following Operation Cast Lead in 2008-9, Blumenthal has produced a vivid portrait of a society experiencing what he argues is the logical result of being based on an ideology of exclusion and exceptionalism. He weaves history with anecdotes, poll data and contemporary Israeli news sources in producing a rich tapestry that depicts modern Israel in all its ugliness; a racist, fearful, imperialist and anti-democratic nation ruled by an economic elite whose aim is to consolidate its power by sacrificing the soul of the nation and endangering its future. Far from being the democracy it is made out to be by Israeli and American media, Goliath makes clear that Israel is an apartheid state whose ruthless policies toward Palestinians in occupied Palestine and Israel are justified by the argument that the survival of the Jewish state depends on oppression. The government indoctrinates youth to accept militarism from the age of five by constantly evoking images of the Holocaust, while distorting its own history of ethnic cleansing that continues to this day. In schools, the media and all its institutions, children are taught to support endless war by ignoring the humanity of their Semitic relatives and portraying them all as terrorists or more fundamentally, “the other.” The cost of such indoctrination is a nation of citizens who accept a distorted history of Israel that blinds them to the injustice that the rest of the world sees. 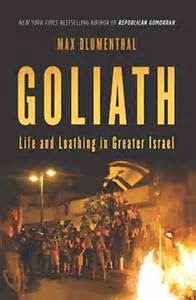 Goliath has something new for everyone, from those who know little of the truth about Israel to those who have made a study of it save those who have researched every aspect of the situation. The neophyte will be exposed to the rudiments of Israeli history, from its roots in terrorism prior to its creation to the Nakba, or Palestinian holocaust, which was marked by massacres and masked expulsions, to its long history of flouting international law and standards of human decency. It challenges all of the lies about the Arab-Israeli “War” of 1948 and the contradictory claim that Palestinians left voluntarily, selling land that had been in their families for countless generations. For those familiar with the basics, the details of how the government has turned from right wing to fascist (according to many interviewed for the book) prove enlightening. Quotations from members of the Israeli government are particularly revealing. They show the extent to which the public accepts antidemocratic and blatantly apartheid messages, highlighting the growing power of the hard right in the Knesset. Blumenthal explains how the public has been seduced into accepting laws and policies that undermine the claim that a Jewish democracy is possible. He argues that the indoctrination from childhood of Jewish Israelis to regard Palestinians as inherently violent and dangerous leads them to conclude that they must be dealth with by any means possible. Particularly interesting are the poll data that indicate that a majority of Israeli youth and a growing number of older Israelis value a Jewish state over a democratic one. There is widespread acceptance of discriminatory laws designed to meet the demographic imperative that Jews must always outnumber non-Jews to retain Jewish dominance over the government, non-Jewish Israelis and policies toward Palestine and other Arab states. There are few protests over a series of recent anti-democratic laws that not only undermine the principle of equality of all Israelis but that restrict the rights of Jews who dare to dissent from the right wing policies of the government. Contrary to the predictable argument that Blumenthal is what Zionists call a “self-hating Jew,” he interviews a number of Jewish Israeli activists who express anger and frustration at having their voices suppressed and their views demonized. The problem is so bad that most Jewish Israelis who want to resist the “liberal” orthodoxy that accepts Zionism as a given choose to do so from outside the country, where 13% of Israelis now reside. The continuing immigration of fanatic Zionists, many of them religious radicals who populate the settlements and form the backbone of the government’s supporters, is intensifying the drift toward fascism resulting from the suppression of real liberal dissent. Goliath: Life and Loathing in Greater Israel is a jarring challenge to the mythology spun by the Zionist propaganda machine in both Israel and the US. It provides a compelling argument for divestment of private capital and an end to the billions of dollars in unconditional aid from US taxpayers each year. As such, it is an important addition to the growing chorus of voices of Jews of conscience around the world who are saying “Not in my name.” US support of Israel does not serve the interests of America, Palestine or even Israel. The prospects for peace in the Mideast and the world depend on justice for Palestine. We are all Palestinians now. 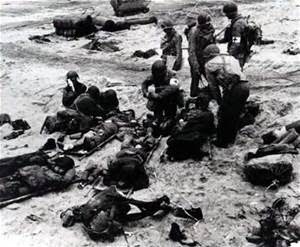 Every June 6th, we honor those who gave their lives on the beaches of Normandy so that freedom would not die. It is only fitting that we put their sacrifice in perspective if we want to avoid condemning another generation to world war, one that could destroy human civilization as we know it. With the expansion of the global corporate Empire that threatens to impose a one-world government of, by and for the Masters of the Universe, that is a very real threat. Iraq, Afghanistan, Libya, Syria and Ukraine are just the tip of the iceberg. Unnoticed by most Americans, the US military footprint is in nearly every country around the world that has yet to submit to the Empire. The Western world sees WWII as a fight to defeat global fascism. In the victorious Allied nations they are taught that we made the world safe for democracy. That claim rings as hollow as the lie that WWI was the “war to end all war.” All wars are banker’s wars, fought primarily by the children of the poor and the middle class. WWII was the inevitable result of the brutal economic conditions imposed on Germans in the Treaty of Versailles. An oppressed people will always turn to fascism when they have no democratic alternative. When the Germans chose Hitler as Chancellor, they condemned themselves and the rest of the world to a bloody period of struggle for dominance as the fascist government showed the world its full implications. Far from being a war for freedom, WWII was a war for who would become the winner of the global game of Risk that would leave only one power standing. The Anglo-American alliance became a tool to defend capitalism against the threat of the communist alternative, one which had it been allowed to proceed unchallenged by the military power of the Empire could have become a model of democracy and economic justice for the world. The USSR squared off with China and the NATO Empire, only to collapse from the strain of its economic inefficiencies and the need to expend vast resources to defend itself from Western imperialism and the advance of corporate Empire. The CIA was created to serve the interests of the war profiteers who sought to colonize the planet, dominating it with the creation of what they still hope will become a permanent fascist New World Order. When Kennedy tried to end the Cold war, the national security state determined that he was a threat to “American interests,” defined as the interests of the international corporate terrorists who dictate US foreign and domestic policies to increase their power and wealth. As such, he became a target for elimination. With the murder of JFK, RFK, MLK and Malcolm X, America lost its way. The Vietnam war continued until the political costs outweighed the political benefits and the movement they helped build largely ended, its task of securing human freedom unfinished. Let the gruesome images of the bodies littered on the beaches of Normandy serve as a graphic reminder that allowing injustice anywhere is a threat to justice everywhere. As such, it is the the sine qua non that enables all wars. If we want to honor the millions who died in the war to defeat fascism, we will join together in a united international front against fascism and war. It is the only hope for us to prevent our children from becoming the tokens in the global game of Monopoly, a zero-sum game where the winner can only succeed at the expense not only of the vanquished, but those who are forced to fight war for corporate Empire.